I read a kid's book, and I liked it. There were no wizards. But there was a lot of cooking. 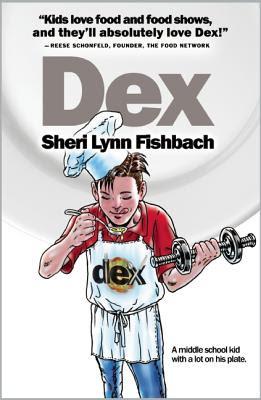 Dex Rossi, the main character of the book Dex , by Sheri Lynn Fishbach, is a middle-schooler who likes to cook. He has a business in front of his house selling sandwiches before his school day begins, and he sells more at school. A geeky sort of kid with a crush on a classmate who seems to favor jocks, Dex faces all the same sorts of problems that average kids face, but he's also got worries about the family restaurant and his desire to save money for an exercise machine that will help him bulk up to impress the girl. As as adult, there were a few times when I shook my head and said, "no, that's not likely," but then I had to step back and realize that the book is, of course, fiction. And it's written for kids who will breeze right past the little inconsistencies. This is exactly the sort of book I would have read as a kid - I loved Nancy Drew mysteries. But the fact that this kid is really into cooking was the icing on the cake. Hehe. Icing ... cake ... get it? This would be a fun book for kids who like mysteries or for kids who love cooking.